My name is Nguyen The Vu. I live in Vung tau city, a beach city next to Sai Gon. I love languages very much and I have begun to share my language knowledge with many people around the world. have been a classroom and online professional language instructor for more than ten years. Now I am taking an advanced course specializing in Psychology in University of Social Sciences and Humanities which belongs to Vietnam National University - Ho Chi Minh City, one of the best national universities in Viet Nam. 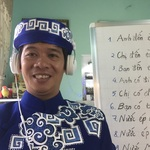 Up to now I have helped hundreds of people to learn Vietnamese as well as the culture of Vietnamese people. Vietnamese language is a very wonderful language. It is the combination of Western language and Eastern language. This is a very special case of languages. The language itself is like the music, so when you learn Vietnamese, it seems that you are practicing to sing. This helps many people to get more joys in their life. My learners come from all over the world. They are teachers, scientists, students, parents, students, tourists ...who want to learn more about Vietnamese and its culture. Many of them have had the best travel in Vietnam, as they can share some ideas with the local people, they can enjoy their holiday as much as possible. For me, the time with my students is not only a lesson, but also a time for enjoy, when we can enjoy a new experience about new things and also improve our thinking, our intelligence and our passion. Now please choose one of your suitable time and tell me anything you want about your language expectations of Vietnamese, so we can arrange for our first meeting and discuss about our studying, our language sharing. For the learning material, I will send to you all the necessary materials for learning Vietnamese as soon as I have your contact and they are all free of charge. So, why not have a trial today? A new door for happiness and joys is waiting for you!!!!! I am an interpreter of Vietnamese - English; English-Vietnamese. I have also been working as a translator in Vietnam for more than ten years. I love languages. I have just graduated from the University of humanity and social science of Ho Chi Minh city. My major is about phsychology, especially psychology in education, teaching, helping people study better.